Senior official Wang Yifu, head of a Chinese-appointed parliamentary delegation for Taiwan-related issues, participated in a group discussion during China’s National People’s Congress, last week [March 2017]. 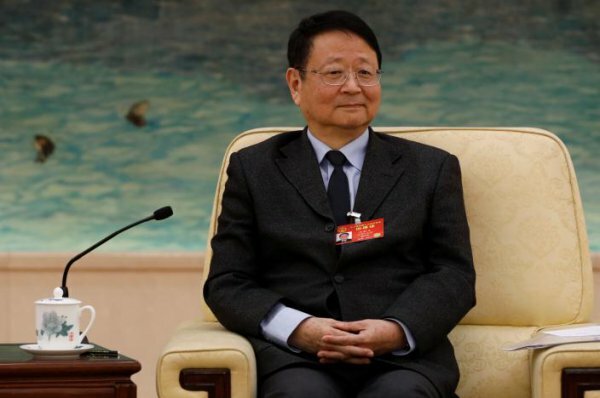 Mr Wang voiced his hope that “the new language […] in the work report of the 19th congress of the Communist Party” will result in warmer relations between Beijing and Taipei, but gave no further details. The official, however, maintained a firm position regarding Taiwan’s political status, declaring that the island would face “catastrophic harm” if it formally proclaimed independence. Last week, Taiwanese Minister of Defence alerted to growing tensions, as China conducted naval exercises near the island. China will formulate "new language" towards relations with self-ruled Taiwan when the ruling Communist Party holds a key congress later this year, a senior Chinese official said on Friday, holding out hope for an improvement in strained ties. China has heaped pressure on Taiwan, which Beijing views as a breakaway province, since Tsai Ing-wen of the pro-independence Democratic Progressive Party won a presidential election last year, cutting off a formal dialogue mechanism and taking two of its diplomatic allies in Africa. China is deeply suspicious of Tsai, suspecting she wants to push for the island's formal independence, a red line for Beijing, though she says she wants to maintain peace with China. Speaking on the sidelines of the annual meeting of China's largely rubber-stamp parliament, Wang Yifu, president of the official All-China Federation of Taiwan Compatriots, said he had always been optimistic about relations with Taiwan. "I hope cross Taiwan Straits relations will start to warm ... after the new language regarding cross Taiwan Straits in the work report of the 19th congress of the Communist Party," said Wang, who holds a rank equivalent to a cabinet minister, without elaborating. The once-every-five-years congress is China's most important political event of the year, when a new generation of senior leaders will be ushered in, though President Xi Jinping will remain in office. Wang is a member of the Chinese-appointed Taiwan delegation to parliament, made up of defectors, their descendents and others who trace their roots to Taiwan, to support China's position that the island is theirs. Proudly democratic Taiwan has shown no interest in wanting to be ruled by autocratic China and its people have no say in who China decides are its representatives at China's parliament. Wang warned that if Taiwan formally declared independence it would "bring catastrophic harm" to the island. Defeated Nationalist forces fled to Taiwan at the end of a civil war with the Communists in 1949. China has never renounced the use of force to bring it under Beijing's control. Zhang Zhijun, head of China's Taiwan Affairs Office, told parliament's Taiwan delegation this week that the end of the road of Taiwan independence is unification. "It wasn't tough talk, but the inescapable truth," said Wang, whose ancestry is Taiwanese but was born in China in 1950. China will resolutely oppose and contain Taiwan independence, Premier Li Keqiang on Sunday at the opening of parliament. Chinese jets and warships carried out exercises near Taiwan and into the Western Pacific last week, as Taiwan's defense minister warned of a growing threat from its giant neighbor.